Chick-Fil-A Leadership Academy and six DBHS clubs service local communities in December. 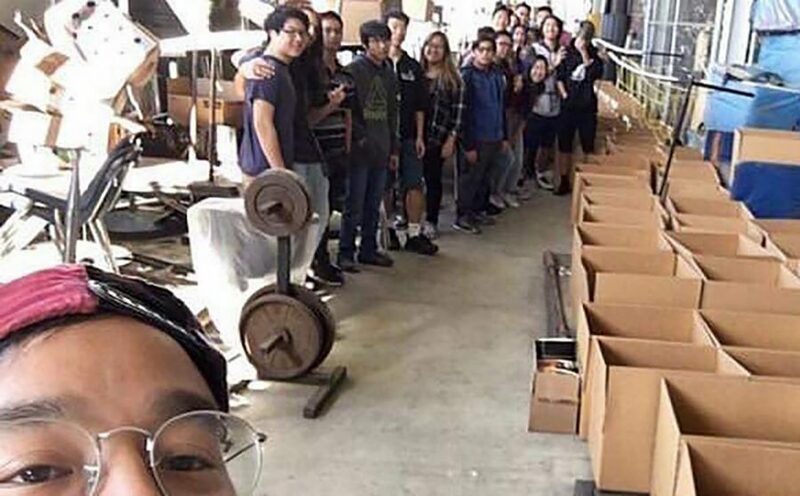 Photo courtesy of JUSTIN PANLILIO Walnut High School Key Club advisor Justin Panlilio, along with WHS and DBHS Key Club members, prepare to pack cardboard boxes with donations. December was a month of good deeds for service clubs at Diamond Bar High School. Six clubs held donation drives throughout the month, collecting various items to give to veterans, the homeless, foster children and others in need. Key Club’s canned food drive collected the most donations. Members teamed up with National Honors Society, Red Cross, UNICEF, Interact and Leo Club to collect hundreds of cans. The DBHS and Walnut High School Key Clubs passed the cans they collected to the Walnut Valley Kiwanis Club, which held a holiday food drive with 100 boxes of fresh produce and more than 2,000 cans. In addition to helping Key Club with their canned food drive, Red Cross held a Veteran’s Wishlist drive. The club received 85 donations, which included toiletries, tissues and other daily necessities. Senior Rachel Wang contributed to more than half of the donations in the drive. The Chick-Fil-A Leader Academy, composed of athletes from all over campus, split into three groups. Each group decided on and executed their own service project, and one of the three groups held a blanket drive. They gave the blankets to a church in Downtown Los Angeles to pass out to the homeless. These projects were meant to serve as practice for the group’s goal to complete one big service project at the end of the school year, a tradition that Athletic Director Albert Lim hopes to continue in coming years.